Reprise: What kind of thinking is Design thinking? I was delighted to receive the following email a few days ago from John Webb, a friend and former colleague who is a senior counsellor (check his bio here au.linkedin.com/pub/john-webb/22/211/b8a). 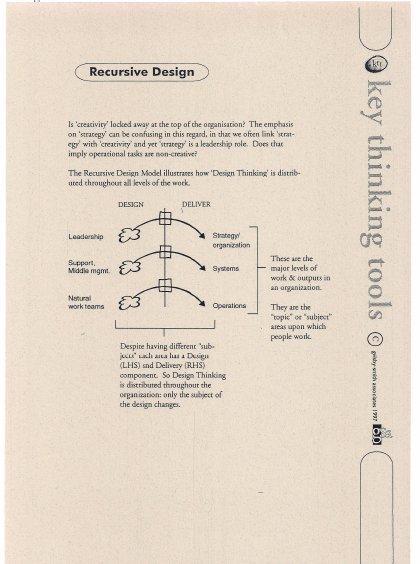 It confirmed to me that I was not too wide of the mark in characterising the key cognitive moves in “design thinking”. Although I had written the paper based on my characterisation of this “trajectory of thought” in more explicit arenas of design disciplines, I was allowing myself to be shaped by a long history of self-reflective practitioners of creative thought, including Blaise Pascall, Albert Einstein and Arthur Koestler. So it is great to see the resulting description resonate so deeply with the experience of a professional counsellor. I’ve just found and read your paper "What kind of thinking is design thinking?" Actually, I printed the paper and took it to bed the other night at the end of a day’s counselling with a couple, and I couldn’t turn off the light until I finished. Mate! When I got to the sentence about the persistent practitioner becoming "uncommonly sure-footed" on the slippery mountain side of indeterminacy, I decided to drop you a line of appreciation. The paper describes exactly what I do every time I sit with anyone. DT-I is a great description of conversation about life, and the ‘making’ is most often a relational space (intra- as well as inter-personal), which reveals pretty-well all the elements you describe so well. I love the way you describe what is required of the ‘designer’, especially on dealing in hope and being present in hope. In a recent conversation with Bryce Cassin one topic we covered was his Ph.D. work – a fascinating nexus between Dewey, perception, design thinking and clinical safety. Bryce worked for some years as a safety investigator in the hospital systems of Australia. During that time he wrote up somewhere around 150 cases with no forethought that one day he might use those as a research resource. In recent years he has turned back to those cases, applied some strict filtering principles, and used them as the raw materials for the grounded ethnography that underlies his doctorate. The key point of this little biography is the significance of how Bryce proceeded before he turned back to give technical names to what he was doing. The parallel in the history of Second Road lay in the work of it’s prior incarnation as Golsby-Smith Associates (1989 to 1997) which began largely as a group of technical writers – at least that was the identity of the marketplace attached to us and which we fought strenuously to be distanced from. What was it that that group was doing before Richard Buchanan looked at it and said that we were the essential third and fourth order designers? I thought that would be an interesting question to ask in a discussion about design thinking. In being “reader-based” and precociously asking “Why?” at the highest levels of the company, we actually re-shaped work itself into customer back aligned systems. So of course now we would talk about such work as “user-based design”, and the processes of “work design”, and ourselves as “design thinkers”. But what was it actually, naively, at the core before we turned back to name it and imported the signifier “design”? A clue lies in the pursuit of purpose as an integrative force in the production of innovative, integrative artefacts for customers. Phenomenologically, the answer to that question lies at the heart of “design thinking”.